In November 1999, WHO/WPRO (Western Pacific Regional Office) announced a "Tuberculosis Crisis" in the region to bring tuberculosis to the greater attention of member nations, as well as partner countries and organizations. Dr. Shigeru Omi, the newly nominated Regional Director for WPRO, suggested that priority should be given to the need to control tuberculosis, as poliomyelitis in this region had been virtually eradicated, leaving tuberculosis as the most serious threat. The crucial task is to promptly raise the DOTS coverage from the present level of only 46% of smear-positive patients to 100%. This announcement clearly manifests the determination to eradicate TB in the entire region. In order to do so, the Technical Advisory Group (TAG) Meeting to Stop TB in the Western Pacific Region, was held in Manila, the Philippines, in February this year. This is a new move towards establishing a system in which TAG coordinates and advises based on the co-operation between the NTP authorities of each country and their interagencies and partners. It was most impressive that Dr. Ahn from WHO/WPRO, Dr. Kochi who participated as an observer from the WHO headquarters, and many other Kiyose Alumni played active roles in the February meeting as NTP Managers representing their countries. In the meeting, we confirmed the significance of the global target and had keen discussions on items including the importance of political commitment and coordination between NTP and the health sector reform. The outcomes of these discussions were incorporated into recommendations to the government of each country. In my 30-year career as a TB expert, this was my first time to encounter such great enthusiasm for tuberculosis control. As Chair of the TAG, I sensed that something was surely beginning to happen and was utterly impressed. In terms of number, most TB-related problems of the region have arisen from the upper seven high-burden countries: China, the Philippines, Cambodia, Papua New Guinea, Laos, Mongolia, and Vietnam; It is thus extremely important to improve these countries' programs. At the same time, however, if countries with intermediate prevalence, such as Japan, the Republic of Korea, Singapore, Malaysia, and Taiwan (though currently outside WHO), were to make more effort in resolving their own problems, that would generate a stronger international partnership and in turn be a great help to the High TB Burden Countries. The same can be said for countries of another category in the region; more specifically, the Pacific island countries such as the Solomon Islands, Vanuatu, Guam, and Fiji. It is quite possible that by 2010 a breakthrough in the TB problem will be made for the first time in history, provided that each WPR country and their partners try harder to resolve TB problems in their own areas. Dr.Mori attended the meeting as Chariman. 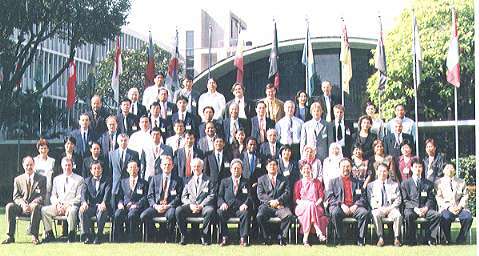 The 30th IUATLD World Conference on Lung Health was held from 14th to 18th September 1999 in Madrid, Spain. I was impressed by the presentation, "Tuberculosis - New Directions" by Dr Arata Kochi, Director, Stop TB Initiative, WHO. He pointed out the movement of tuberculosis control in the world from the 1980s to the present and showed future directions. In the 1980s, tuberculosis was "disappearing" and was recognized as being "too difficult to control under developing countries' reality". In this situation, the IUATLD played an important role. In the IUATLD Model Program, the Union introduced 1) standardized case management, such as definitions and treatments, 2) cohort analysis, 3) reliable drug supplies, 4) competent technical leadership, and 5) effective mix of vertical and horizontal services. Then the 1990s became the era of "DOTS and GTB (Global Tuberculosis Control, WHO)". The magnitude of the tuberculosis problem and cost-effectiveness of tuberculosis control were shown in the World Bank Report in 1993. Training, surveillance, advocacy and partnership were strengthened through various activities, such as development of WHO modules, marketing of DOTS as a brand, and collaborations with international NGOs and donors. Additionally, research activities in tuberculosis were reinforced in the 1990s. Now, DOTS strategy is well understood and global interest has increased. Dr Kochi pointed out that the present situation of DOTS is very similar to that of EPI in the 1980s. From the experience of EPI, he suggested that DOTS needs continued strong global leadership and country-level social mobilization. He concluded that Stop TB Initiative including the establishment of partnership, tools and research, would play the important roles of moving global tuberculosis control from a technical focus to a social development focus. At the conference, I met many ex-participants from many countries. They seemed to be implementing tuberculosis control activities well in their countries because many of them presented their excellent activities. Unfortunately, we could not have our usual alumni meeting in Madrid. I hope, however, that we will meet again sometime and somewhere, and will have opportunity to have an alumni meeting at that time. Stop TB Initiative Steering Meeting was held from Thursday through Friday, 13th to 14th January 2000 in Washington, D. C., US. 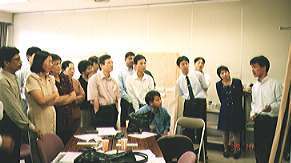 This Stop TB Initiative was launched on November 1998 at the IUATLD Bangkok meeting to strengthen 1) communication, 2) country support, 3) monitoring / evaluation, and 4) research, for global tuberculosis control, through establishing global partnership. In this meeting, progress made since the Madrid Steering Meeting was presented and discussed: 1) Overview of Objectives and Progress in Stop TB Initiative, 2) Global Partnership Agreement to Stop TB, 3) Institutional Arrangement, 4) Stop TB Funding Situation, 5) Global Business Plan, and 6) the Global Drug Fund. In the session of Global Partnership Agreement to Stop TB, a draft Agreement was shown, which includes the commitments of governments, international agencies and NGOs to strengthen their tuberculosis control efforts. Although further discussions by all partners will be necessary to finalize this draft, I hope that both our existing and new partners will move to more concrete collaboration to fight against tuberculosis in the near future. In this issue, we would like to introduce our basic research activity in RIT. I am in charge of Molecular Pathology Division, RIT, Tokyo. We are interested in M. tuberculosis-induced granuloma formation mechanism using animal models. Our final goal is to develop a novel therapy against tuberculosis by elucidating the granuloma formation mechanism. I want to describe what we have done so far in our laboratory. I have five regular staff, two foreign scientists and two graduate students under my supervision. Interferon (IFN) gamma-, tumor necrosis factor (TNF)-alpha-, and IL-18- knockout mice were infected with M. tuberculosis strains (H37Rv and Kurono) using an inhalation exposure system apparatus. A knockout (KO) mouse is one whose particular exon of cytokine genes was disrupted by homologous recombination. Seven weeks later these mice were sacrificed for histopathology and lung and spleen tissues were snap-frozen to examine cytokine mRNA expression levels. Interferon-gamma- and TNF-alpha KO mice developed multiple necrotic lesions in the lungs, spleen and liver, when virulent H37Rv and Kurono strains were utilized. A virulent BCG induced non-specific pneumonia but did not induce granulomas in TNF-alpha KO mice, while it induced granulomas with occasional multinucleated giant cells. Large pulmonary granulomas were developed in IL-18 KO mice, but no necrotic lesions were found. Nitric oxide (NO) activity, which is an indicator of anti-mycobacterial killing, was measured using a Griess reagent. NO activity was impaired in IFN-gamma and TNF-alpha KO mice, but recovered with addition of recombinant IFN and TNF. Inflammatory cytokine mRNA expression was elevated over time in these KO mice. On the other hand, IL-18 KO mice developed large granulomatous lesions lacking central necrosis. Compared with the levels in wild-type mice, the splenic IFN-gamma levels were low but the IL-12 levels were normal in IL-18-deficient mice. The reduced IFN-gamma production was not secondary to reduced induction of IL-12 production. The levels of nitric oxide (NO) production by peritoneal macrophages of IL-18-deficient and wild-type mice did not differ significantly. Granulomatous lesion development by IL-18-dificient mice was inhibited significantly by treatment with exogenous recombinant IL-18. Therefore, IL-18 is important for the generation of protective immunity to mycobacteria, and its main function is the induction of IFN-gamma expression. Taken together, only TNF-alpha seems to be involved in M. tuberculosis-induced granuloma formation. If you are interested in our study, please visit our website. on a JICA follow-up mission. They made field visits, attended a series of meetings/discussions with ex-participants and concerned people in NTP, and held a seminar on TB Control. World Health Organization (WHO) kindly provided two publications ('Tuberculosis Handbook' and 'Tuberculosis Treatment') which were distributed together with "TB Microscopy," published by JICA/RIT to attendants of the seminar. Throughout the visit, Dr. Haluk C. Calisir (ex-participant of '98) accompanied the team to facilitate the mission activities on behalf of the ex-participants. A seminar on TB control was organized jointly with the Ministry of Health on 1st February. Approximately 100 people from various regions participated in the seminar. Dr. Cihangir Ozcan, Deputy Undersecretary, chaired the first session and was present throughout the seminar. Dr. Emel Kibaroglu, Director of TB Control, Deputy Directors of General Directorates of PHC and Curative Services, and other officers of the Ministry of Health attended the seminar and made their comments. Dr. Haluk C. Calisir presented the current situation of TB epidemiology in Turkey. Dr. N. Ishikawa made a presentation and discussed how to strengthen the national TB control programme based on problems identified in the quick NTP review in Turkey. Professor Ferit Kocoglu (ex-participant of '82) chaired the second session on TB laboratory. Dr. Feyzullah Gumuslu (ex-participant of '98) presented an overview of laboratory work in the national TB programme in Turkey. Ms. Akiko Fujiki lectured on the importance of establishing a TB laboratory network and quality control for microscopic examinations on sputum smears. The seminar was successful in various aspects. Current problems in TB control in Turkey were discussed, particularly on DOTS, MDR-TB, and sputum smear examination. Before leaving Turkey, the team held a discussion at the Ministry of Health on possible future collaboration with JICA and RIT to strengthen the national TB control programme in Turkey. Dr. Sevda Ozdogan (ex-participant of '89), the first sitting from the left, accompanied with us in Istanbul. Dr. San recently retired from his job as director. We are pleased to introduce his activity and contribution to NTP in Cambodia. I graduated from Faculty of Medicine in Cambodia in 1970. From 1971 to 1975 I worked in pediatric service in a hospital in Phnom Penh. After four years of genocide regime (Pol Pot time -1975 to 1979 - most Cambodians became slaves working in the field), I again began working in general medical service in Phnom Penh city. My story with TB control started in 1982 after I was appointed by the Ministry of Health as a vice-director for the National TB Program/National TB Centre, where I later became a director. 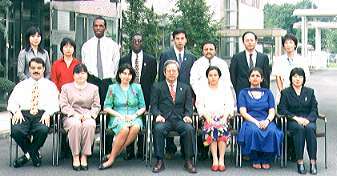 In 1985, I joined a course on the Methodology of TB in Paris/Alger and also in 1993 I was given the opportunity to participate in the Advanced Training Course of TB control in Kiyose. For this good opportunity I would like to thank the Japanese Government and JICA for also supporting Cambodian people to participate in the training regarding TB control. In June 30, 1998 I was nominated as a university professor of and hospital practitioner for medical faculty in Cambodia. TB control activity in Cambodia maybe divided into two periods. From 1980 to 1993, TB treatment was implemented following the long regimen (2SHE/10 HE, 2RHES/10 HE). I began by trying one step at a time to expand TB control activity to cover all health facilities, most of which rested after civil war - 100% on the provincial level (21 provinces) and 60% on the district level (68 districts) - because at that time, war was still continuing in some places. At fist, we had irregular training and supervision. Drug supplies were frequently in shortage. Only 20% of our national budget was for TB control. However, we also got some funding from NGO and International Organization like: UNICEF, Red Cross France, and WHO. At that time we achieved a cure rate only 50%. 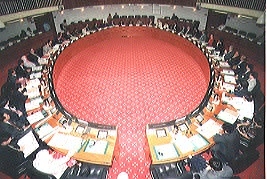 The second period began with the implementation of SCC and DOTS strategy. Our National TB Program was reviewed with the collaboration of MOH and WHO. We decided to implement SCC and DOTS strategy in Cambodia following the treatment regimen recommended by WHO (2RHZE/6EH; 3SRHZE/5R3H3Z3; 2RHZ/2RH). Beginning with training, I tried to expand SCC and DOTS strategy step by step from province to province with regular supervision and to additionally ensure no shortage of TB drugs. We applied DOTS strategy by hospitalizing all TB patients in their first two months. During the first implementation and further expansion stage, WHO and JICA strongly supported us and, untill 1998, we received further support from the World Bank. In this way, we achieved an over 85% of cure rate in treatment, with a new case finding rate of 53%. (NTP Report 1998). These good results achieved in Cambodia in the last few years are due to providing greater access to all TB units and also due to major and serious efforts based on strong government commitment regarding TB control. Though we still have some difficulties and obstacles, we are sure to overcome these together with our partners. We are now planning for 2000-2004. Sustaining the current strategy (DOTS implementation) is very important to get a cure rate of more than 85%, increasing the new case finding rate by 10%, and applying DOTS 100%. We are also now on the way to strengthening implementing health units by decentralising TB control activities (DOTS) to health centres through operational districts and referral hospitals. Finally, I would conclude that Cambodia's application of DOTS strategy since 1994 has helped patients to successfully receive treatment so that the cure rate is more than 85% while there is an additional 53% increase in the detection of smear positive cases. So far, DOTS has improved the cure rate of TB patients. Personal growth, professional enlightenment and a deep feeling of admiration and respect for people and their cultures were what I obtained during my stay in Japan. I learned many things of the type not written in the books, and acquainted with marvelous people among the teachers, my peers, and the people of Kiyose. Mixed feelings invaded me because of the different realities between the countries that participated. On one hand, I felt sadness upon perceiving the hopelessness in many of my peers, and at the same time happiness upon verifying that efforts like these instances of training motivate us to leave aside imaginary problems like color, religion and borders, and understand that unity in a common goal, such as combating tuberculosis, will determine overall social and economic development. My final thoughts, after arriving from a so distant and different world that now I feel is somewhat mine, is the deep gratitude to those who allowed me to enter into personal or familiar intimacy with them - the most sacred thing that we have - and the valuable opportunity to look through different eyes at how the problems in the controlling illness are closely related to the different epidemiologic realities in which we live. Health-illness processes cannot be approached separately of their context. Sometimes the answers are easy to find when we learn how to move away from the tree in order to look at the forest. We were privileged to be the last participants for the TB Control Program in the last millennium. Some of us were already trained in laboratory diagnosis while others [myself included] were tenderfoots. We arrived in Kiyose on the 13th of September 1999 after about three weeks in Hachioji. Getting to know each other started in the kitchen with passive case finding of the worst chefs and their recent 'case detection' recipes. This was done with the participants for the International Training course on HIV/AIDS from Asia, creating the atmosphere of a real global village. The course structure was tailor-made for laboratory control services. After initial country reports, we moved into lectures on the computation and epidemiology of TB. This was followed by the bacteriology of TB and the immunological aspects. The bedrock of the course, SPUTUM SMEAR EXAMINATION, was well practiced to ensure a high quality of services in our various countries. We were also introduced to culture and drug susceptibility testing. A section was spent on laboratory services after which the course was crowned with the almighty teaching material preparation and an action plan. We could not haveed ask for more with our time schedule. The course was not without its nostalgia. We had the opportunity to visit the western part of Japan as well as the eastern part. These had well known cities like Kyoto, Osaka, Nagano and Hiroshima. Hiroshima will forever be printed in our minds. Finally, space will not permit me to say our ARIGATOs to the esteemed staff of RIT who made our stay possible. To you we will say 'Nyame Nhyira Mmo' - God Bless. ･The burden of our countries in the global TB problem. ･That primary resistance is increasing due to weak TB control programmes. ･That our children and adolescents are being infected now. ･That our children and adolescents may become sick later. ･That our children and adolescents may be the next to die. ･A 23% case fatality and 52.5/per 100,000 mortality are waiting for them. ･Inadequately treated smear positive cases will reduce case fatality, but increase MDR patients. So, don't forget what to do. DOTS seems the best way. In country presentation and action plan working we could share experiences from countries with DOTS, non DOTS, partial DOTS and also, DOTS-Plus. The results are obvious. But shouldn't be too ambitious. We should only do as much as we can supervise. We must learn the complex, but do simple and fruitful things, making small but good results to gain confidence and thus expand. We mustn't forget:: "Step by step. Be 'smart'". Women may help a lot in this work. We could see how much women were doing for TB in Tokyo, Kyoto and at Oizumi Public Health Centre. And what about grandmothers? As Dr. Laing said, they are not stupid! It may be a good idea to incorporate them as well. A New season is coming and with it the flowers: the flowers that represent our gratitude to all that made our stay in Japan enjoyable and fruitful, the flowers that represent the message of peace that comes from Hiroshima, the flowers that represent the candor of Her Highness the Princess Akishino, the flowers that represent a new life; the life of each TB patient that needs to be saved by our hands. 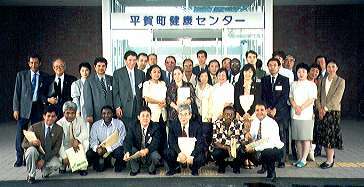 T he 6th International Course on AIDS prevention and care in Asia, sponsored by the Japanese Foundation for AIDS Prevention (JFAP) was conducted at the Research Institute of Tuberculosis in Kiyose, Tokyo, from the 13th of September to 21st October, 1999. Nineteen clinicians, public health specialists, epidemiologists and program managers from thirteen countries of Asia participated in the course. There was tremendous enthusiasm and eagerness, both among the participants as well as the organisers. This being the first trip to Japan for almost all the participants, it was indeed a great learning experience. A striking feature of the course was the diversity of topics included in the curriculum. Keeping in view the background of the participants, all aspects of HIV/AIDS prevention and control were dealt with in detail. The training methodology involved an optimal mix of lectures, group discussions and participatory training. The Project Cycle Management (PCM) classes and the counseling sessions were indeed novel experiences. Besides the classroom programs, the field trips to Hiroshima and Kyoto were eye-openers in the field of research. First-hand knowledge on vaccine development was interesting, though beyond comprehension of the participants, since none were directly involved in this area. However, the field trips brought one close to the rich culture and traditions of Japan. We got to know many aspects of the ancient civilisation and the lifestyles of the Japanese people. Since the time of arrival at the Narita International airport, one was exposed to the clockwork precision of life in Japan. As the course progressed, it was amazing to see the discipline that goes into day to day living. The modesty and the kindness of the people there humbled one and all. The stay in the dormitory in RIT was so comfortable that it was like a home away from home. All participants looked eagerly upon the idle gossip and banter that accompanied dinnertime. In the end, one could not help but shed a tear while bidding farewell to such a wonderful experience. * Organization of RIT has changed since this April.